I'm "double dipping" this week. In addition to participating in Tablescape Thursday with Susan of Between Naps on the Porch (and since today's table features a LOT of PINKNESS), Beverly of How Sweet the Sound was kind enough to allow me to be part of her much-beloved Pink Saturday. If you're haven't already visited both Susan and Beverly, I hope you will do so. Lots of fun posts await you! In mid-January, I set a table for you that featured dishes made in a Central European (former) sovereign state, Czechoslovakia. The pattern featured a bird of paradise pattern. You can see it HERE. The china I'm using today is also marked "Epiag," and has a backstamp that indicates production sometime between 1922 and 1945. I purchased these at an estate sale two years ago. To be perfectly honest, I didn't find the pattern particularly appealing. I did like the number of serving pieces, the shape of the cups, the near-mint condition of the pieces, and the soft pastel colors. In fact, the pattern is called "Pastelle." The asking price for the set was a reasonable $125. By close of business on the last day of the sale, the dishes were still unsold. I was able to negotiate the purchase price down to an affordable $30. For that price, they seemed far lovelier. Still, the china remained wrapped and stored away in a closet. They've finally been given a nice bath, and they've made their way to the dining room ... where they're anxiously awaiting your visit. As I often do when hosting an actual dinner party, I set the table the day before. Here's Czech 2, Pastelle by Epiag, revealed by the morning light. The centerpiece couldn't be simpler -- an orchid in a clay pot, resting in a crystal compote. The table linens are in a narrow range of warm, pale pinks. To soften the look of the potted plant, I wrapped the clay pot in fabric (actually an old wine-colored pillowcase). Here's a closer view of the china pattern. They remind me of Oriental Poppies, but some of you avid gardeners can probably tell me exactly what sort of flowers the design represents. The pale pink placemats are from Dollar Tree. The set of 8 damask napkins was reduced to $2 on day two of an estate sale. So ... placemats and napkins total $10 for a table set for eight. How affordable is that? The vintage flatware is by International Silver. The 1939 deco-inspired pattern is called Starlight. The long handles of the forks and knives indicate that it's a "Viande" version of the pattern. Other American silver manufacturers in the 30s called the style "Grille." Gorham, however, called theirs "Vogue." The Grille/Viande style was quite popular in the 1930s and 40s, but only in silverplated flatware. It never made the transition to sterling, and the look had faded away by the 50s. Some collectors today prize the look and purchase pieces to serve as luncheon sets or fish knives and forks. I decided to use contemporary glassware for today's table. The tall water/wine glasses are "Marquis" by Towle. They're from an antique mall. The champagne flutes were thrift store purchases (approximately 50 cents per stem). The soft pinks on the table echo shades found in the rug below. From above ... in the light of day. I was anxious to light the candles for you. The tapers were quite affordable. A package of 8 had been pre-priced at $14. The discounted price was $7.99. The TJ Maxx clearance price was even better ... only $2 for the package! Upon closer examination, I observed that the candles are covered in a light dusting of gold glitter. For this price, I can live with a little extra sparkle! I like the fact that the blooms are above eye-level of seated guests. They won't, therefore, interfere with across-the-table views and conversations. The angled corners of the placemats help the settings fit together like pieces in a jigsaw puzzle. The candlelight warms the cool, red violet tones of the orchids. The covered casserole (upper left) is in perfect condition; it's one of my favorite pieces on today's table. The gravy boat is another of the serving pieces I like. If you're not inclined to serve heavy, old-fashioned gravies and sauces these days, a gravy boat/bowl is a stylish way to serve flavorful, fat-free salad dressings. The candles add warmth, even before the sun goes down. The extra-large platter couldn't find a home on the table, but it can be passed as needed and returned to the sideboard. It's finally dark; first guests should arrive soon. Faceted glass sparkles prettily in the light of the candles. This is divine Bill. I can't believe that you purchased that setting for that price!!! I know I should be looking at the beautiful dishes, stunning crystal and polished silverware but I just can't stop looking at the amazing orchid! Isn't the colour exquisite and it looks perfect in the crystal bowl! The table is beautiful - the dishes are just wonderful. I learn so much from your tablescapes. You will love my poppy silk plant for my tablescape on Thursday. It would be a match for your dishes! Bill, please let me congratulate you on your thrifty buy; it is beautiful. But I totally understand you about not being keen on it at first...I have a teaset that is taking it's time 'growing on me' :o) it's Czechoslovakian too. So pleased to see you posting again, Bill, it was worth waiting for. I love the pastel color palette you have used this week. So soft and serene. I agree that the flower is a poppy, and it is depicted so lovely on the china. This was a wonderful bargin, especially since it has those serving pieces. How is it that you always seem to find such treasures? I've been looking forward to seeing your latest post... I am not dissapointed! Looking good. Your photography skills get better and better too. I love orchids. They really give a lot of bang for your bucks don't they. I have never managed to get one to rebloom though. Beautiful! Your selection of orchids as the floral centerpiece is perfect. Amazing bargain you received for the china. I always love your tablescapes. Bill this is just stunning in it's simplicity! The orchid is gorgeous so who would need more! I love this china and wow what a price. So many serving pieces and of course I love the pinks! Another winning tablescape my friend! Lovely table! And yes, those are poppies in that pattern... although I've never seen such muted poppies. Beautiful! Love the viande flatware; I bought a set for my daughter, she loves using it and confusing friends! You are an Estate Sale genius. I never have gone to one! You should do a post on HOW to score at estate sales; they intimidate me -- I picture being trampled to death by frantic dealers and early birds! Bill, your tables are always so beautiful! I envy all your estate sale finds and love the way you use them. The orchid is the perfect centerpiece and I love the crystal compote as the container. I could go on and on about your china, crystal and silver!!! Hello Bill~ ~ Lovely again. I just love the pastel china. It's so graceful and delicate. I love the way the coffee cups are shaped. The tip of the handle seems to point up,as in smiling eyes. What a great price on the set, Wow. Patience, it's good you checked back. I will be right over for dinner. Love the pink in the dishes. Everything looks perfect for a special celebration. Your table setting is beautiful! You really did get some great bargains, especially on the china. You truly have a gift for finding beautiful things at bargain prices...then tempting all of us bloggers with your gorgeous tables. The whole scene, with the matching tones of your carpet & the punch of color from the orchid, is simply resplendent. I am never disappointed when I visit your blog & I never fail to learn something, too, before I leave...reluctantly. Lovely as all get out! You have an award waiting for you over @ my blog- (The Sunshine Award) given to positive and creative bloggers, which certainly, is you. Hello Bill, I cannot find words... This tablescape is as lovely as all the others you have done and again you have left me feeling that I need to do something special with my own dining room table. Thank you so much for sharing your lovely home and accoutrements with us. This is lovely, Bill. It has an ethereal quality to it. I've been missing your wonderful posts lately. Hope all is well. This table gives me hope in thinking spring will arrive! When you have time could you come look at a Towle bowl I posted about on 2-22? It was a thrifty find, but I'm sure it is missing the base. Would like to have an idea on what it was. You'd be the expert that might know! I love the knowledge you share with us each time you invite us over to visit! Thanks for sharing. Very nice look, Bill. I had some gorgeous Epiag china with an art deco design that was stunning. I know what you mean about the quality. I love that last picture! I can see why you fell in love with the serving pieces...and you have to have gravy sometimes, don't you? I love pink and gray together. The china has an old fashioned, Sunday dinner at grandma's house look to it. You made it a more contemporary look with the orchid and the goblets. I always love seeing your tables. Lovely table you have prepared with the soft pink with gray. Very pretty. Thank you for sharing all of your beautiful things with us each week. I can't imagine how much time you invest in setting the table each week and then packing it all up. Who would ever guess most of the items came from Dollar Tree, an estate sale, or thrift store?! Another beautiful table...and $30.00 for the china! What a deal you got. I want to go shopping with you sometimes. This table is beautiful! It looks very feminine to me, and I'm a sucker for anything feminine or girly. There you are! I was checking for your newest post and WOW it is lovely. I am so jealous of the price you paid! I am going to have to take your idea of the votives and the taller candles. 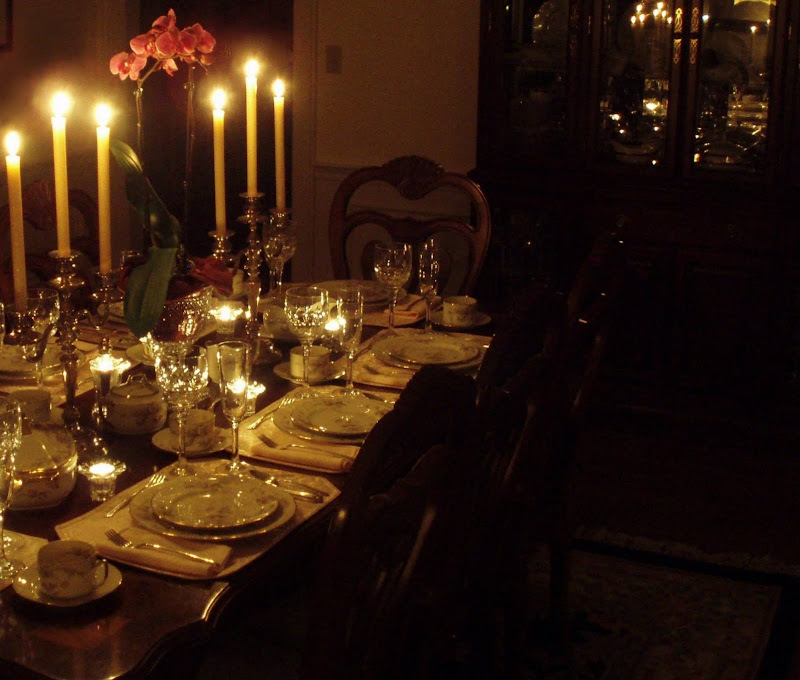 The candlelight makes for such a relaxing evening around a beautifully set table. Lovely table. I'm glad to hear that you shop where we all shop, Dollar Tree and TJ Maxx, Thrift stores. I always enjoy seeing what you've come up with and your photography is beautiful. You have such style, this is such a warm and welcoming setting, and I love your candle shots, you know I always say that, but they are fantastic. They are quite powerful and you could put this shot (cropped) on your top opening bar below Affordable Accoutrements, wow!! Thank you my dear friend for adding my link to your sidebar, you are so kind. p.s. It's 9am Thursday morning here at present and I'm watching one of the biggest Gum Trees being cut down in our street, making way for new water pipes, it's so sad, I heard all the Kookaburras all talking about it this morning as well. I'm going over to see if I can get some big gum leaves before they mulch them all, this tree has huge leaves just like the book "Snugglepot & Cuddle Pie and the Gumnut babies" You may not know it, it's a classic Australian children's story by May Gibbs beautifully illustrated with our native animals. Bill what a lovely table setting, absolutely divine. I am in love with the vintage flatware and with everything else for that matter. What time is supper being served? I think you can make any pattern of china look exquisite! Beautiful setting and love those dollar store placemats! How magical is this? It makes my heart beat faster. The dishes were the buy of the century. The way I rationalize good buys is: paper plates would cost more! :-) Your orchid looks majestic between the silver candlesticks, and the pale pink napkins are a breath of springtime. Ooooh, so pretty in pink!! Your photography is fantastic, especially the nighttime photos! Glad you are back, you have been missed! Wow, you've gotten REALLY GOOD at blog photography! These are things I immediately take note of, and I am impressed. Equally impressed with your magnificent table. Oh, I would have no idea where every glass and such and such goes. You could sure teach me a thing or ten! GORGEOUS! Love the pink placemats with that china. The stemware is lovely too. Such a simple centerpiece but it makes a bold statement. Fantastic photos! I love your table. It looks elegant and sophisticated and I know you said you did not find the dishes atractive (you used another word cant remember it know) before but I think its pretty. Bill, this is so elegant and lovely! The crystal, silver, china! What a great dinner party! Bill, this is absolutely stunning! I love the shots after dark - I shall have to try photographing that way next time. By the way, I think the flowers are anemone. And you got a great deal on that china! Beautiful table setting. I love the china and the orchid compliments your china so well! The table is more than beautiful. I'm new at this, not new to setting tables, new to blogging about them. I aim to do what you do someday - I aim to reach for the stars. Thank you for the inspiration! Bill, I may just have to make a trip down your way if you are able to find such beautiful things at such affordable prices! That china is lovely and it certainly was a steal! I love your flatware as well! Very lovely table. And a great price on the china. Hadn't heard from you in a while, hope all is well. Those are definately Poppies. Such a stunning table, but you alway do exquisite scapes. Hadn't had time to do a table this week, busy at the flower shop. Hopefully next week I'll be able to post my table....Nascar started so it'll be dedicated to my Jim.....hinthint. Hope you stop by my blog soon. the Vintage Alphabet is up and some of the other sites are interesting choices of 'B'. I do declare! I believe you win the Grand Slam today! The elegance, presentation, smart buys -- you win in all categories! You know what my little inner designer self was thinking? Wouldn't this also look swell on silvery gray silk? your table is breathtaking. I love love love those dishes. You are deffinitely a pro, I have sooooo much to learn. Thanks for the great pictures. I'm definitely following your blog from now on! Beautiful dishes, Bill. The pink and gray pallette reminds me of my grandmothers kitchen. The first picture with the morning light streaming in made me smile. WOW! this sure has it, the WOW factor,looks amazing. Bill, I think this china sets a stunning table. I like the soft colors and love the idea of the orchid sitting up in that crystal compote. Beautiful idea, my friend! I always learn so much from your posts. Thanks for sharing the information of all the details. I'm very fond of that silver flatware. I love the china, and how you used the flowers to pick up the color. It is a beautiful table, just stunning! Bill, How rude of me~~ I spent quite some time looking at each picture of yet another gorgeous tablescape of yours. You have really placed everything beautifully. That may not have been a dish pattern I would have chosen either, but what a knockout TS! Love the silverware too. What a great idea to wrap a clay pot with fabric and dropping it into crystal!! Stunning! I'm in love with the whole table. I look forward to visiting with you each week!! Bill, you keep outdoing yourself! I love your china. It is really sweet and delicate. I love the silverware too. What a bargain to find the placemats at the Dollar Store. What a pretty set and you got it for a steal. The orchid is just perfect as the centerpiece. Bill, this is awesome. So elegant & pink is my fave! Bill, your tablescape is so elegant...and so is your dining room! I love all your beautiful bargains. Oh my goodness your table is stunning!! I am a party planner and If you lived by me I would love to have you work at my company and handle some of our table design and then I could take more vacations!! LOL...I do think the flowers are peonies, but perhaps a rarer version??? What a gorgeous table, Bill! Love the soft pink and the dining set! Lovely touch with the flowers too. Happy Pink Saturday. This is the first time I've visited your blog, and it's a revelation. What wonderful photographs, simply stunning. I especially like the last closeup of the orchid, taken from beneath. You are a very talented photographer indeed. The tablescape is absolutely beautiful and deserving of a magazine spread. The fact you got ANYTHING at bargain prices is astounding! Well done you. Happy Pink Saturday - I'll definitely be visiting again. Hey Bill, I just stopped back by to answer your question, my crystal compote doesn't have a lid, and I think you are right about our identical piece, I too think it might be a candy dish, but ain't it great,we(me and you) can do lots of different things with this piece, all of your things are so classy and beautiful....your photo's look like they should be in a fancy home magazine, like SOUTHERN LIVING or MARTHA STEWART. Lovely table - I really enjoyed the beauty of your photographs! I think the pattern is lovely, Bill, but I think that's probably because you gave them the perfect setting! You brought out the pretty pink tones with the linens, and I love how you pay attention to detail and made sure to photograph the pattern of the carpet which really complimented your tablescape! Also the beautiful artwork and the platter. Your artistry is evident in every tablescape and every photograph! Your eye for detail is amazing! And I 'copycat' you a lot! I know I've missed so much here and I'll have to read back this week to catch up! PS ~ I love how your candlelit pictures take on both a pink tone and an amber glow! Bill...your table is gorgeous! The orchid is really pretty...so elegant looking! Candlelight pics were breathtaking! I'm so jealous of your big dining room...mine is so small! Never understood why they put such small dining rooms in house back when mine was built. I loved peeking into your other rooms...great house! Bill, that really is a lovely table! I love your tablescapes, and this one is certainly no excpetion. I think the china is very pretty, and I can't believe you got all of it for $30! That's highway robbery, my friend! LOL! The orchid looked perfect with it, and I liked it displayed in the tall compote. As usual, your candlight scenes were wonderful, as were the linens, crystal, and flatware. Great job! Thanks for going to all of this trouble for us. It's always a pleasure to see your posts. You really work wonders on a dime! I've been very impressed with all of your settings. 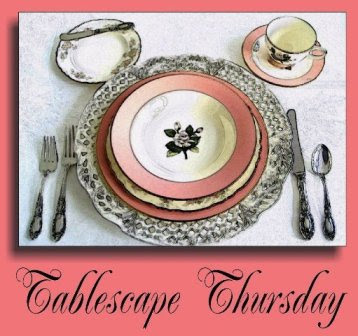 I was actually sad to not see a post from you on today's Tabelscape Thursday! :-) Very clever centerpiece display of the orchids!